A couple of years ago I received a call from a friend at the public defender’s office in Arlington. She had been contacted by the adult children of a father who had been incarcerated for civil contempt nine months ago and remained in custody. Since it was not a criminal case the P.D.’s office could not represent him. I agreed to take the case. One of the things I learned in reviewing the case history was that, at the time the defendant was incarcerated his salary was being garnished the maximum allowable amount for support and other divorce obligations, but it was less than the amount ordered. Hoping to shake loose the money the custodial parent thought Father had, her counsel sought contempt and incarceration and prevailed. While the Father was incarcerated, he lost his job and lost his home to foreclosure. And Mother and the child were deprived of the money that he had been paying by garnishment. Talk about lose-lose. We were able to obtain father’s release from prison but he was unemployed for a long time thereafter. The last I heard of the matter he still earned much less than he did at the time he was incarcerated. Had the safeguards that, on Monday, the Supreme Court held were required by the U.S. Constitution been in effect in this case, maybe this bad outcome for all involved would have been avoided. I have also had my share of frustrating child support and other family law collection cases as Plaintiff’s counsel. This is an area of important competing interests that must be balanced in arriving at sound public policy. The Supreme Court struck the proper balance in the Turner case. See my June 21st post for the Court’s ruling in that case. 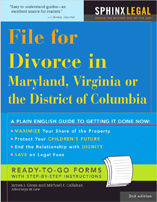 Overnight Guests During Visitation Will Maryland Grant a Gay Divorce?